Private Beach Access, Private Pool, and a Block From the Beach! Welcome to Best Kept Sea-Cret ! This magnificent gulf front home is located in the coastal community of Frangista Beach. “Best Kept Sea-Cret” features 9 stunning bedrooms and perfectly blends both an modern and an coastal aesthetic. 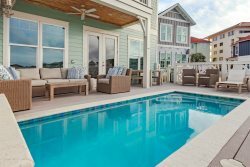 The first thing that you will notice upon arrival is the spectacular courtyard with a private pool, spa, BBQ grill, fire pit and plenty of chaise lounge seating for sunbathing. Stepping through the french doors, you be greeted by an bright and beachy living and dining space. On the first floor is a Queen Suite, two bunk rooms, and a game room. The first bunk room has two sets of full-over-full bunk beds, this room sleeps 8. The second bunk room has a full-over-full bunk bed and sleeps 4. The elegant and cozy first floor Queen Suite includes a master bath. For indoor entertainment, the game room features a pool table, bar table, and flat-screen TV. For your ease, there is also a laundry room and kitchenette with a full-size refrigerator on this floor. On the second floor you will find a wide and spacious living area. This space flows into the dining and kitchen areas — giving optimal space for easy conversation. There are stylish, comfortable leather couches and a large TV in the living area, perfect for movie nights! Up to 12 guests can sit around the formal dining table, waiting to embark on a culinary adventure prepared in the gourmet kitchen. The kitchen is fitted with all stainless appliances and necessary cookware to inspire your inner chef. There is an adjoining breakfast bar offering 4 additional seats. Finishing this floor is a King Suite with a private bath, as well as a King suite with an attached shared bath. The third level consists of three thoughtfully designed bedrooms. You will find 2 King Suites, each featuring their own private bathrooms. Also located on this floor is the Master King Suite with an large and luxurious bathroom featuring dual vanities, a spa tub, and separate shower. This room also features french doors to the large balcony which overlooks the pool area and beautiful Frangista Beach community. Lastly, travel the spiral staircase to the fourth floor will you find sleeping quarters with two twin beds and a flat screen TV — idyllic for the kiddos! Come stay at “Best Kept Sea-Cret” where you will be treated to a range of high-end amenities and features that will be the setting for lifelong memories. Pool Heat - From October 1st - May 1st, the private pool/spa can be heated for an additional $50/day or $300/week. Pool heat must be purchased for the entire stay. This home has what is known as an overflow Spa. That means that the pool and spa share the same heating elements. To have the spa heated, the pool would have to be heated as well which is only offered for the above dates.